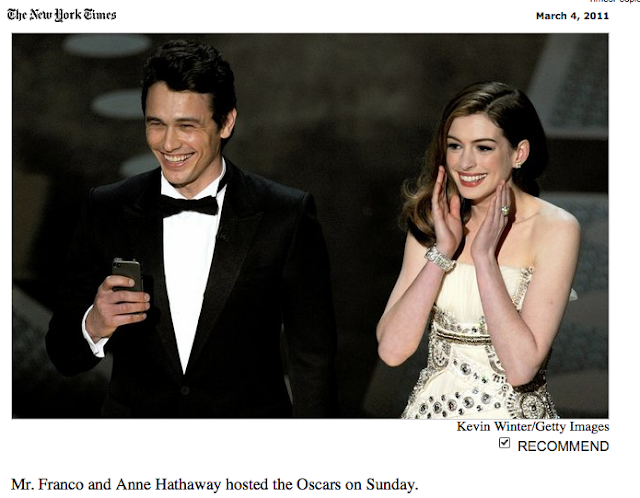 By LISA W. FODERARO, March 3, 2011, New York Times. On Sunday night he was in Hollywood, as co-host of the Oscar telecast in black tie. At 9 the next morning, he was in a Starbucks in New Haven, hunched over a book and barely recognizable in a gray sweatshirt, but still wearing his tuxedo pants. Mr. Franco seemed to shrug off the bad reviews of what many in the national news media called an inert performance at the Academy Awards show. Yet later on Monday, he pounced on The Yale Daily News for some mild criticism of his monosyllabic Twitter style, posting a message with an obscenity scrawled in red Photoshop paint. Yale has had its share of screen-star students, including Jodie Foster and Claire Danes, who have walked a delicate line between visibility and aloofness. But by all accounts, Mr. Franco, 32, who arrived last fall as a full-time student in Yale’s Ph.D. program in English, has straddled the line like no one else — at once the retiring scholar and the focus of attention. In campus interviews this week, several people said he had worked to keep his new role more of an intense character part than a lead. Even at Yale, home of overachievers, he stands out. He has found time to undertake a multimedia musical production with about four dozen undergraduates that will open on campus in April. He is listed as a producer, but has worked with students on all aspects of the show, “The Stargazer,” including casting, making script revisions and acting in the film elements. Among students, attitudes run the gamut, from indifference to curiosity to full-blown obsession. Ileana Lucos, 21, an environmental studies major, said she and her friends were on high alert for news of Mr. Franco’s whereabouts. For his part, Mr. Franco strikes a balance between staying “almost under cover,” as Dr. Warner put it, and indulging his fans. This week he posted pictures online from inside his room at the Study at Yale, a boutique hotel where he stays when not commuting to his apartment in New York. Still, Mr. Franco is clearly not your average graduate student. Last semester, when he and Dr. Warner needed time to discuss a paper, Mr. Franco’s personal assistant helped arrange an unusual solution. Jorge Castillo contributed reporting from New Haven.